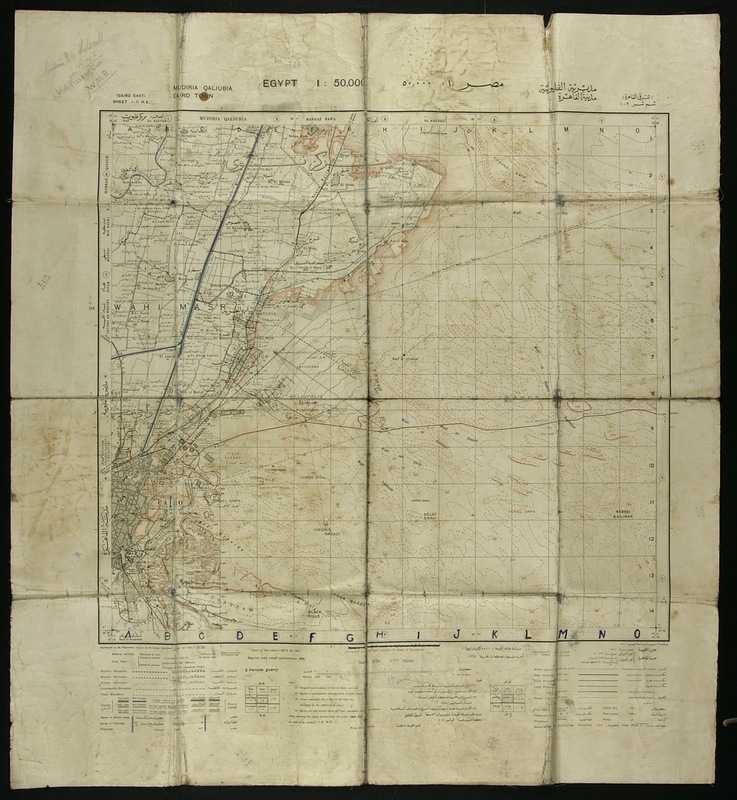 The map came into the library in a donation with other maps, which were duplicates from the Archives New Zealand / Te Rua Mahara o te Kāwanatanga. 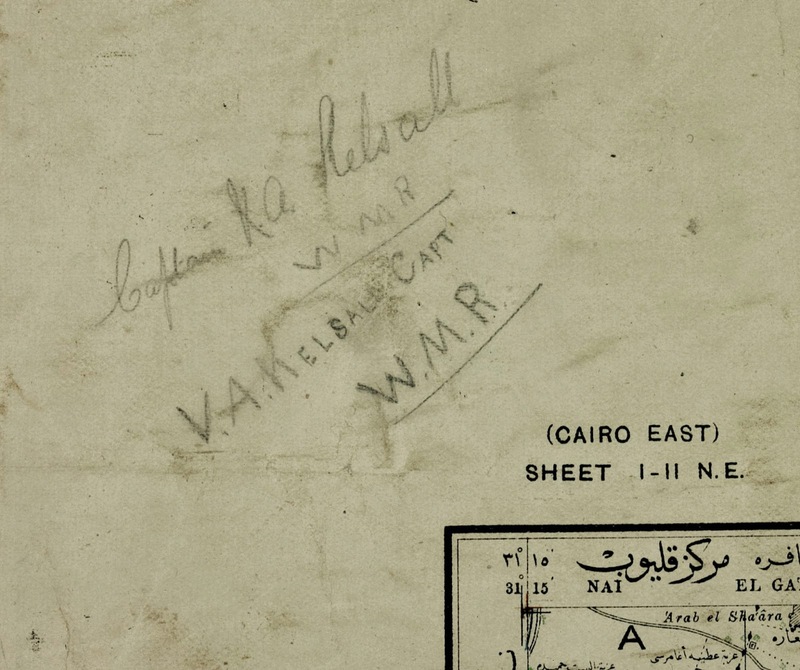 In the top left corner is a signature which has been carefully transcribed, “Captain V.A. Kelsall WMR”. Victor Albert Kelsall was born in 1875 in Scotland but soon moved to New Zealand. He fought in the South African War, receiving medals for his service, and later returned to South Africa and served in the Transvaal Mounted Rifles. In 1906 he received the Zulu Medal for his part in operations against the Zulu Rebels. On returning to NZ he farmed in the Marlborough Sounds as well as being a surveyors assistant. On 26 August 1914 at Palmerston North, soon after the outbreak of the First World War, he enlisted in the Wellington Mounted Rifles Regiment. 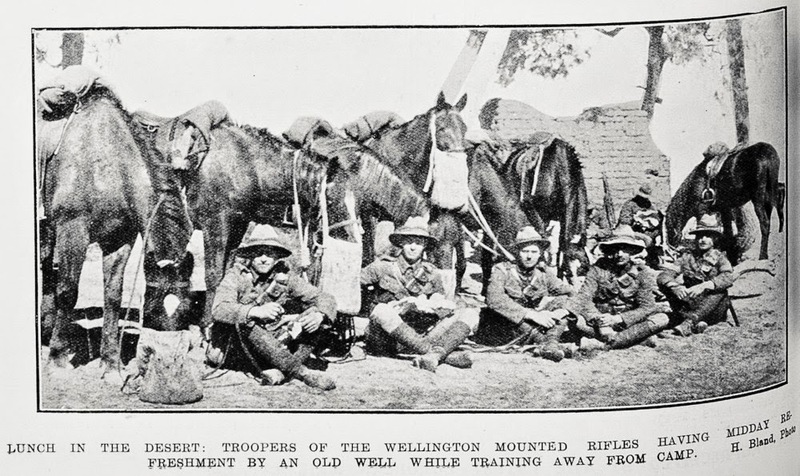 On 15th October he departed Wellington on the Arawa and on the 4 December 1914 the Wellington Mounted Rifles Regiment disembarked and proceeded by train to Zeitoun Camp. The NZ soldiers trained here until the departure of the infantry to participate in the landing on Gallipoli Peninsula on 25 April 1915. 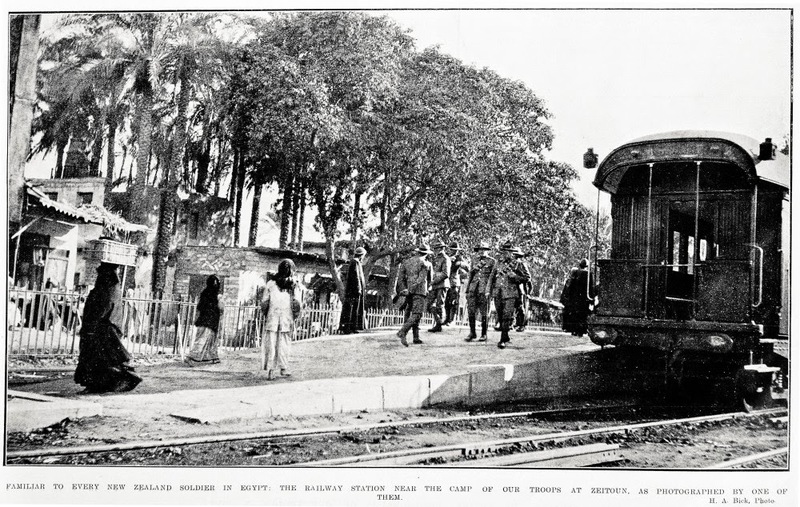 However on the 8 May 1915, the mounted troops were also ordered to prepare to board the train for Alexandria, en route for Gallipoli. They arrived and landed after dark on the 12 May. By June it was clear a different strategy was needed to break the stalemate at Gallipoli. It was decided to try and take the heights of the Sari Bair range, which would threaten Ottoman control of the peninsula. One of the objectives was a hill known as Chunuk Bair. On the morning of the 8 August the Wellington Battalion, supported by the Auckland Mounted Rifles and two British Battalions managed to take Chunuk Bair. The Ottoman’s soon returned to try and seize it back. The next day the Otago Battaliion and the Wellington Mounted Rifles Regiment relieved the defenders and desperately held on through enemy attack as well as friendly fire from artillery at Anzac Cove. 'Tortured by thirst, in desperate pain from open wounds, the gallant little force refused to be beaten. It was during this momentous phase in the operations that the magnificent morale and inspired example of the officers of the Regiment asserted themselves with splendid results. While the position was exposed to the full force of the attack, and one part of the line appeared to be weakening, Colonel Meldrum, Major Elmslie, and Captain Kelsall sprang from their shallow trenches and hastened to restore the line. Major Elmslie and Captain Kelsall both fell during this critical time. But their example was not lost” (Wilkie, A.H. (1924). 'Official war history of the Wellington Mounted Rifles Regiment 1914-1919'. Auckland: Whitcombe and Tombs, p.55). Chunuk Bair and Gallipoli were eventually taken back by the Ottomans. Victor Kelsall remains there, his place of burial is unknown, but his name appears on the Chunuk Bair NZ Memorial, along with the names of 850 others killed in the Battle of Sari Bair and in other operations in this sector. 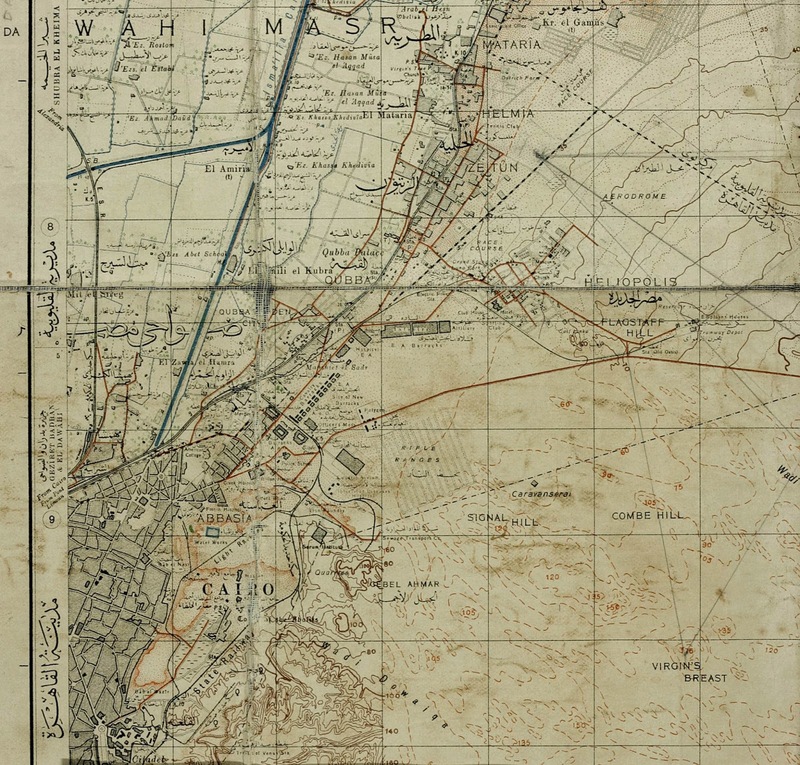 His map of Zeitoun Camp is in the Sir George Grey Special Collections (ref: NZ map 8064). The First World War exhibition is on now at the Sir George Grey Special Collections, located on Level 2 of the Central City Library. The exhibition is open daily from 9am-5pm during the week and from 10am-4pm at the weekends. You can read about the exhibition and its opening in two earlier blog posts. If you can't visit the exhibition in person, then make sure you check out the online exhibition including the section on Egypt & Palestine.